As an English major undergrad, I plowed through reams upon reams of literature and literary critique, cultural studies tomes and other articles and books. Nearly a decade later, one of the readings that struck me and stuck with me the most is John Edgar Wideman’s “The Killing of Black Boys.” Originally published in Essence in 1997, the essay describes the nightmare within Wideman’s nightmares: the battered, ruined face of Emmett Till, the black youth murdered in Mississippi in 1955. Till’s crime? Being from Chicago and aged fourteen, removed from his city-slick, less racially tense environment, Till was tragically ignorant of other people’s ignorance, prejudice and devastating cruelty. This baby-faced, dapper teen, showing off for a clutch of country boys, made a pass at a white woman. For that, he was abducted, mutilated and murdered. An all-white jury found his accused killers not guilty; the two men later admitted to the slaying and described it in detail for a magazine article. Outrage over Till’s death and the swift, sham acquittal helped galvanize the civil rights movement. Buried in Burr Oak Cemetery in suburban Chicago, Till was briefly exhumed in 2005 in hopes of finding more clues to his murder; he was then reinterred in a different coffin. Chicago, the nation and world have been shocked to learn of the recent and possibly years-long scandal at Oak Burr. Four workers are accused of digging up and dismembering bodies then dumping the remains in shallow, mass graves. Freshly vacant plots were then resold with the families of the deceased new and old equally unsuspecting. While the perpetrators of this scheme thought better than to disturb Till’s grave, they did leave his original coffin to rust amidst rubble in a shack, despite collecting donations to create a lasting memorial. Considering the flocks of tearful families searching for loved ones’ graves, it hardly takes the addition of Emmett Till to make this transgression more disturbing, maddening and deeply sad. After all, for those with the depravity to disinter and tear apart bodies for profit, shoving the dilapidated coffin of some old civil rights’ icon in a shed would barely seem like a crime at all. But it is, and it hurts. It abuses American history, as twisted and painful it already is. 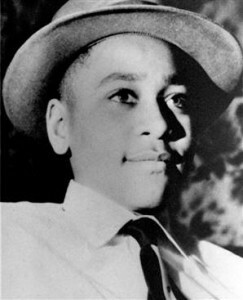 It hurts that for many, Emmett Till is a hazy memory if not a total unknown. And it hurts that he had to be further forgotten—conned and disgraced—to be remembered again, and for some, learned of for the first time. Whether or not you’re familiar with Emmett Till’s story, I encourage you to read Wideman’s “The Killing of Black Boys” (this linked copy is clearly transcribed; forgive the handful of typos). It is more a personal narrative than a rendering of history; off the scholarly track, perhaps, though the history we remember, how it affects us and how we choose to tell it is just as powerful and revealing. The essay can also be found in the book, The Lynching of Emmett Till: A Documentary Narrative , edited by Christopher Metress (find in your local library). For more general resources, the Emmett Till Wikipedia article has a number of readings and external links. Posted by Meg Holle in Cemeteries, Death + Crime and tagged civil rights, corpse abuse. Bookmark the permalink.